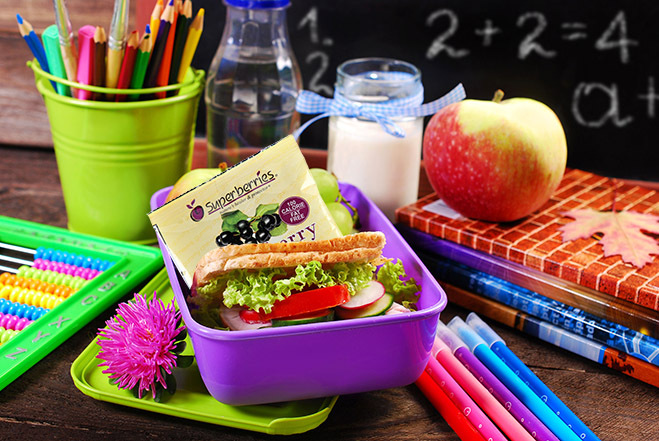 If your kids are grumbling about boring lunches or you are experiencing a lunch rut at work, put these easy tips into practice to make your midday meal super fun and easy. Discuss what the kids would like to eat for the next week, shop on Saturday and assemble lunches together for the week on Sunday. Make suggestions for different foods for variety. Lunch doesn’t always need to start with a sandwich. We love Tiffany from Peanut Blossom’s idea to never repeat the same lunch in 30 days. Some of her ideas include roll-ups, nibble plates, and stacks as the main course for lunch. Fruits and veggies come in all shapes, sizes, and products. Consider adding fruit gummy chews like Superberries Aroniaberry Gummies which are made from 100 % Organic Aroniaberry Concentrate. Or veggie stix or chips made from beets, spinach, and carrots. Make lunch art. Create fun lunch-scapes using simple products to create faces. Cut up our Aroniaberry Gummy Chews to make eyes, noses, and smiles. Check out the themed lunches created by Jill from Kitchen Fun with My 3 Sons. Lunch periods are getting shorter and shorter. Pack bite-size pieces of sandwiches, crackers, fruits, and vegetables. It will be less overwhelming and give your lunch more variety. For more ideas about how to create exciting lunches look below. We've assembled links to over 500 different lunch ideas. We’ve included links that focus on adult lunches and lunch for kids.